Eric: Ladies and gentlemen, boys and girls, we’re here to talk about sports! Sports are perhaps the ur-games. Probably organizing alongside early militaries as tools for training and proving of skill, they have grown to eclipse armed conflict for many, serving as a sort of proxy for violent aggression. But what happens when sport seems unnecessarily violent, and we need a proxy for that? 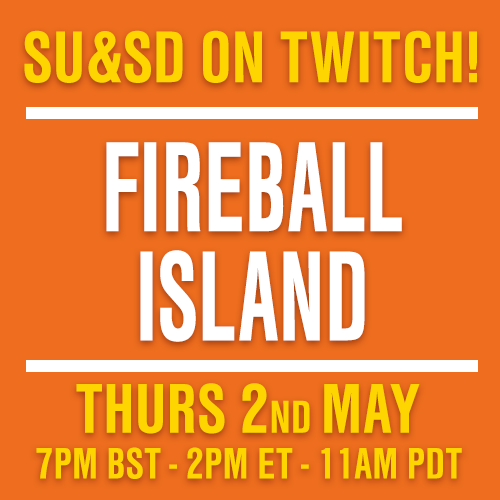 Today we’re looking at two possible solutions. 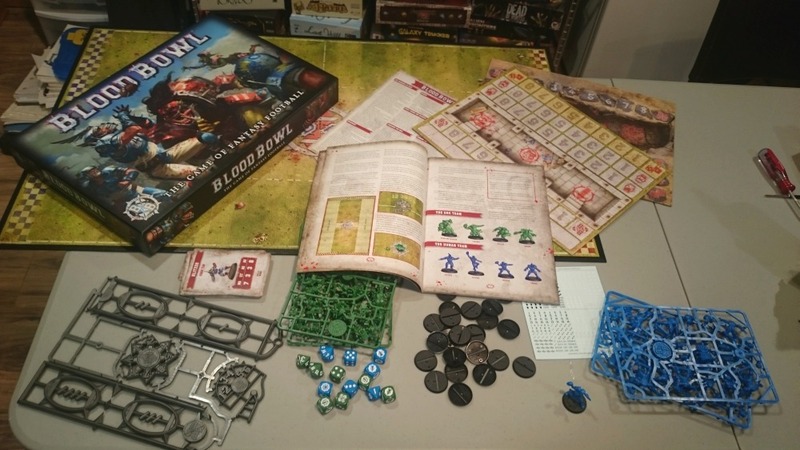 Blood Bowl is the grandparent of sports miniatures games. It’s a rollicking high fantasy version of North American football in which you can violently maim opposing players. 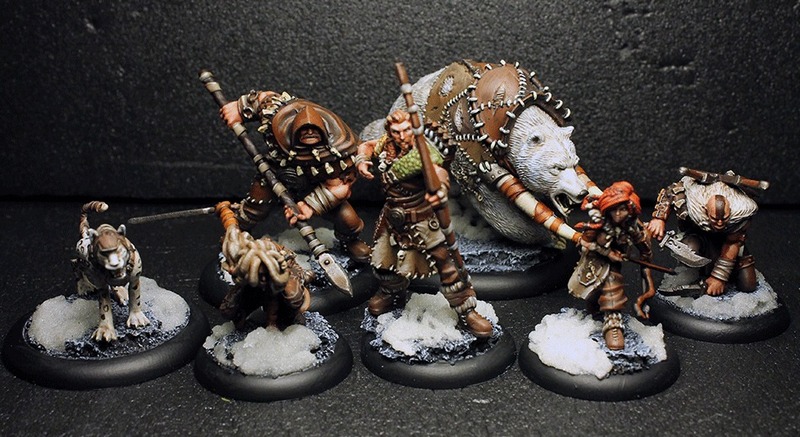 Guild Ball, meanwhile, is a newcomer to the scene which has quickly gained a following. It is a gritty low fantasy version of soccer (or “actual football”) in which you can violently maim opposing players. While there are nuances to the themes, both games are clearly competing for similar space. So, in true sports fashion, let’s put them in a ring and see which one scores the most points. Or violently maims the other player. First up, Blood Bowl! Games Workshop has released a new starter set (seen above) for the hugely influential classic first published in 1986. Each player assembles a team of miniatures from one of the Warhammer world’s iconic (and now largely extinct) races. The members of the team are differentiated by a few simple stats and perhaps a skill or two. Play occurs on a “pitch”, a board with a grid on which the miniatures are maneuvered. A player starts activating models one at a time, moving, “blocking” (a transparent euphemism for “violently seeking to injure”, much like in American football), or taking a special action. As long as everything goes as planned, they can then activate another model. But if something goes wrong (a “turnover”), play switches to the other side. If that last sentence didn’t clue you in, what Blood Bowl is really about is risk. Risk and chaos and getting screwed by dice with little symbols. To do almost anything besides moving through wide open space requires you to roll dice, and there is the potential for almost any of those rolls to go badly and end your turn. Star players fall on their faces trying to do the most basic of blocks. It can take multiple turns just to pick up the ball, bouncing it back and forth like a badminton rally powered by shame. Sometimes you get to activate your whole team; others your first player fails miserably. Much of the strategy of assists and formations is about weighting this luck. Ideally, this forces you to prioritize your actions and keeps you involved every step of the way. It can also be incredibly annoying. Pictured: The author of this article, being annoyed. Physically, the new version is lovely. The miniatures are beautiful and dynamic, representing human and ork teams. While you do have to clip them from a sprue and should ideally glue them together, they are only a couple pieces and do snap fit. Plus, if you want to try your hand at painting, this is a great starting place. Also in the box is a pitch and a pair of dugouts (player boards) which are double-sided, showing a neat human setting on one side and a delightfully orky one on the other. Also handfuls of dice and other accessories. 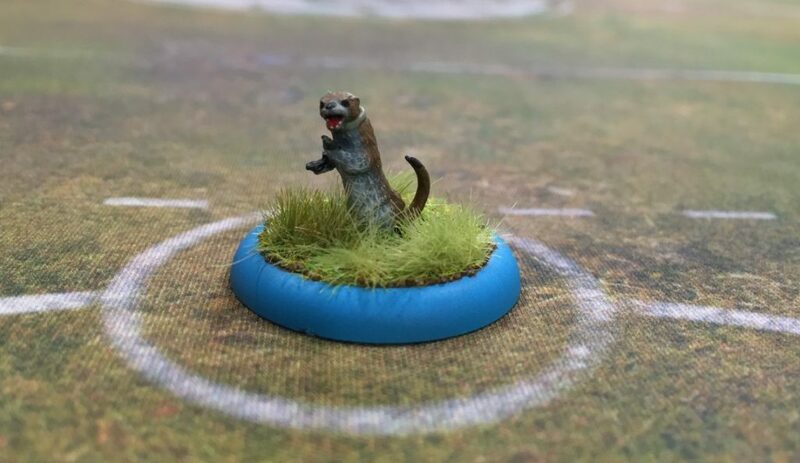 All of which sort of sums up Blood Bowl, but also leaves out its heart. 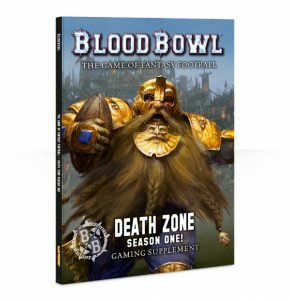 The people I know who love Blood Bowl and still play it, going for years without new releases or official support, do so because of one thing: leagues. Essentially the sport version of a campaign, leagues see teams grow and change. Players might be injured (or killed), they gain experience through things like passing or scoring (or killing), and they permanently grow and change. Leagues are such a significant part of Blood Bowl that some teams which seem sub-par in one-off games are popular because of their potential to level up more quickly. Leagues are great, although running one requires purchasing an additional book (seen below). That said, if this is your game, the cost is worth it. Blood Bowl is the reigning champ. Many games have sought to emulate its success. Titles like Kaosball and Dreadball have stepped into the ring, but none have been able to land a knockout blow. The veteran still stands triumphant. But if one of the slick new contenders has a shot at dethroning the king, my money would be on Guild Ball. 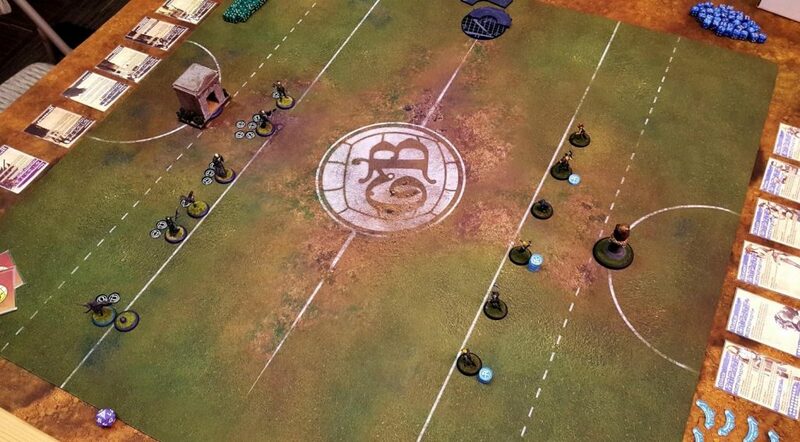 Image of Guild Ball courtesy of the By Brush and Sword blog. 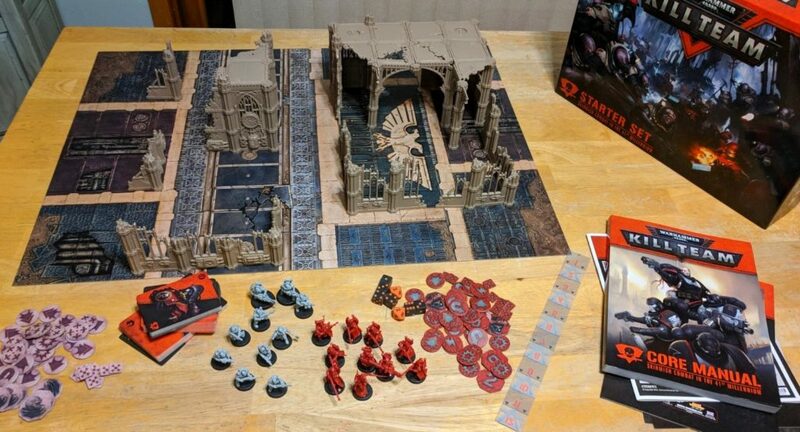 Guild Ball, Steamforged Game’s riff on fantasy sports with medieval guilds replacing elves and ogres, came out of the world of modern miniatures rulesets. It shows. In the first place, unlike BB and its many pretenders, Guild Ball is a true tabletop game. There is no grid board players move across; you can practically feel the wind in your hair as you unfurl your tape measure. The rules themselves are quite clever. Ball-handling is smooth, with a simple snap-locking system that allows players to pick up an uncontrolled ball simply by passing near it. 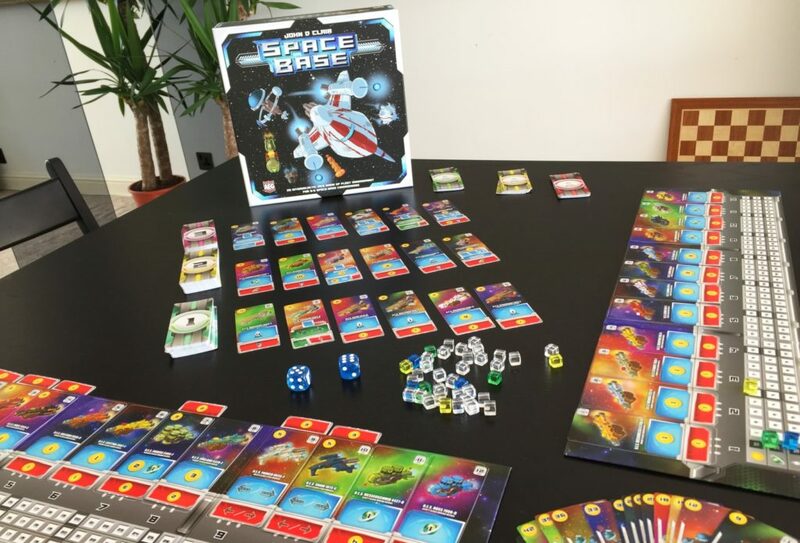 It uses pools of six-sided dice to resolve most actions, and while there are still plenty of rolls to ruin your plans, the randomness isn’t as blatant as its competitor. It also uses several novel mechanics. One is the playbook. Similar in some ways to Arena Rex, attacks by different characters don’t automatically do damage. Instead, each success allows a choice to be made on a different level of a playbook. This might mean simple wounds, but it can also include dodges, pushes, knockdowns, and special abilities. While some levels are fixed, others allow a choice, making rolling damage a dramatic reward rather than yawn-inducing admin. Another interesting mechanic is influence. Each model generates influence points for the team. These points are pooled and then, before each turn, allocated to players. This allocation is not necessarily based on who generated the influence. Which matters because Influence is what you use to do basically everything, from moving more than a pittance to shooting to punching someone in the face. This creates an intriguing fusion of the strategic and the tactical – while turns play out with alternating activations of individual models, you have to invest in what they will do before they act. With practice this allows for bluffs and gambles about how the turn as a whole will play out. …And I need to stop right now, because you probably think you know where this review is going. 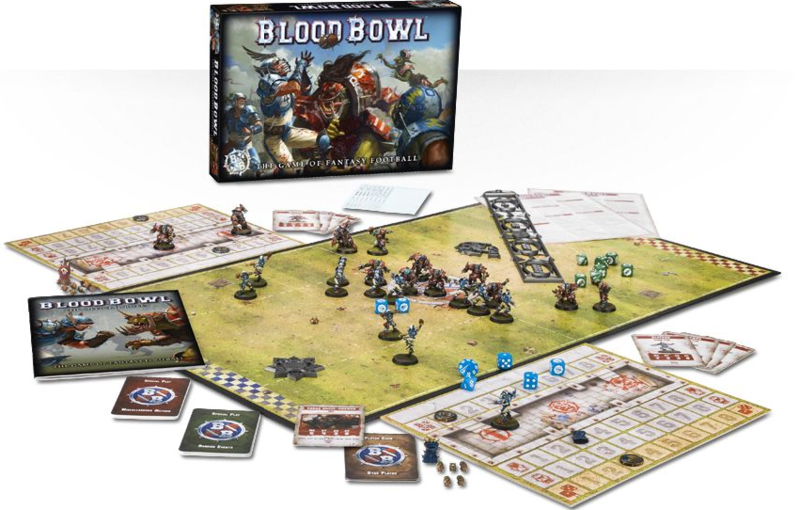 You think I’m going to say that Guild Ball has bloodied Blood Bowl’s nose, and that it’s the sports game you want. Truth be told, before breaking out Blood Bowl again, I thought the same thing. But this is where I need to make a distinction that I think really matters in assessing these games. Let’s go back to the idea of sports. Playing sports – really playing them – is a skill-intensive process. It requires physical conditioning and practice and dedication and tactical thinking. Sure, there is pickup ball with some friends in the street, but if someone who actually plays the sport shows up, you’re all in serious trouble. Watching sports is about the narrative. It is about getting attached to certain players. Seeing them succeed and seeing them fail. It is about skin-of-your-teeth victories and terrible upsets. It is Greek comedy and Shakespearean tragedy. And I have to admit, Blood Bowl does a better job at capturing that experience. 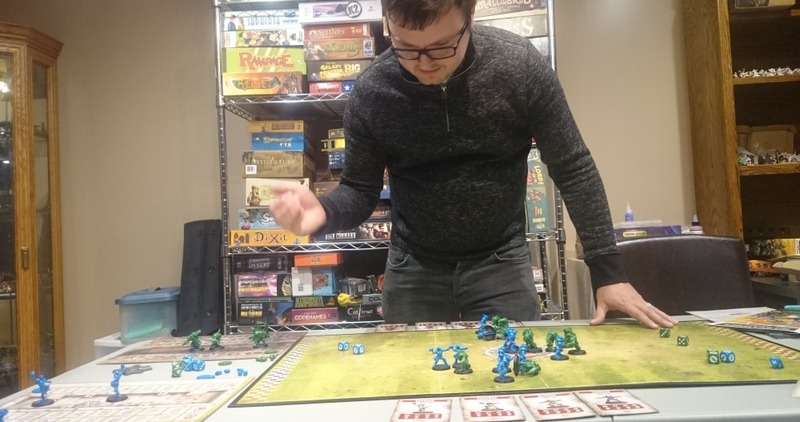 Some people have dismissed Blood Bowl as a “beer and pretzels” game, a goofy exercise that’s more interested in getting laughs than it is in hosting your competitive urges. 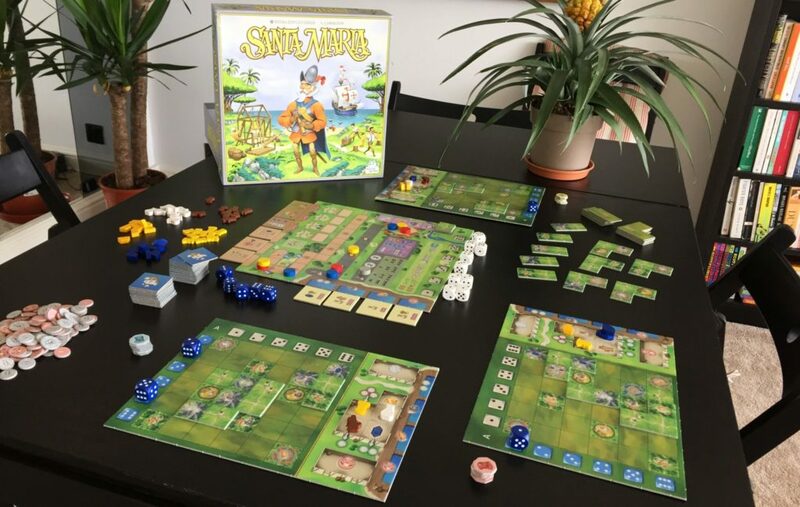 But that isn’t at all fair – there is a decent amount of skill and strategy to it, and a good player with a well-built team will smash a newbie. That said, I also sort of want some beer and pretzels in a game about sports. Sports, when I enjoy them, are about eating hot wings and yelling and laughing and shaking your fist at the whims of fate. Sometimes that star player does fumble the ball. Sometimes your quarterback gets knocked out. And Games Workshop captures that experience almost perfectly. So make of that what you will. If you want to hone your craft at a game, to analyze and maneuver, then Guild Ball is a great pool to dive into. But if you simply want to root for underdogs and curse as your plans fall on their faces, then I know some orks that would be happy to have a new coach.